Traditionally, spaghetti squash is baked in the oven for up to an hour. 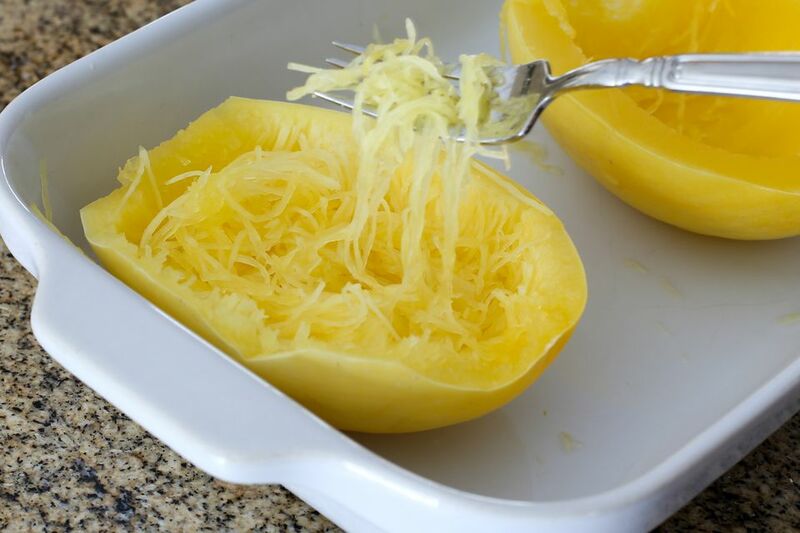 If you are short on time or are seeking shortcut, try this quick and easy method for microwaving spaghetti squash. With a large, very sharp knife, carefully cut the stem end from the spaghetti squash. Stand the squash up on the flat end and slice it in half lengthwise. This will be easier than the harder stem end. With a spoon, scoop out the seeds and scrape out any loose, stringy membranes. Place the halves, cut sides down, in a microwave-safe baking dish. Add about 1 inch of water to the dish. Microwave on full power for 8 to 12 minutes, depending on the size of the squash and your microwave oven. A smaller squash will take around 10 minutes. Test the squash with a fork. It should be tender enough to penetrate the skin with very little resistance. Remove the baking dish from the microwave oven, drain, and flip the halves over. With a fork, gently scrape the insides of the halves to loosen the squash strands. Serve right away or refrigerate the "spaghetti" and warm up later. Serve the squash hot, tossed with butter and salt and pepper, to taste. Or, serve it with a tomato based pasta sauce or Alfredo sauce. A small squash will yield about 2 to 2 1/2 cups, enough for 4 servings.